Pazdigrad is a neighborhood situated on the eastern edge of the city, open to the sea and heterogeneous in character. Because of the state of the existing road network and the position of surrounding buildings it lacks a clear urban structure and it is difficult to clearly determine a future neighborhood center. 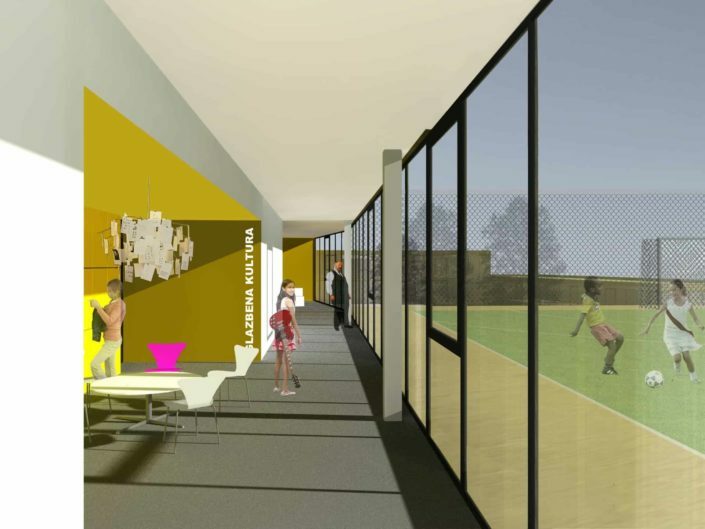 Currently, the proposed site is a plant nursery that resembles a green oasis in an otherwise densely built neighborhood. The conceptual proposition for the school and kindergarten takes advantage of existing assets and obviates the disadvantages of the surrounding environment. 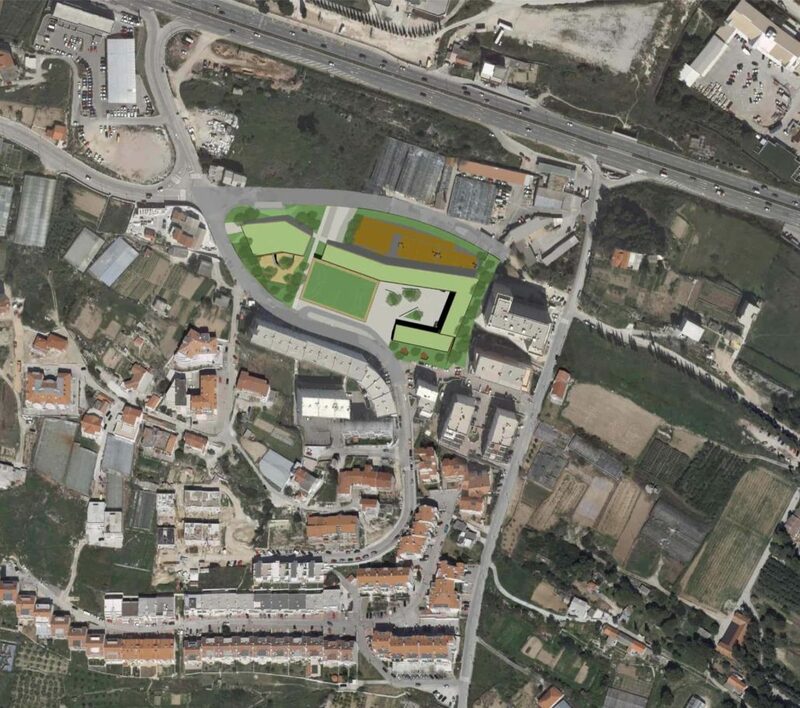 The project aims also to create a new civic center for the neighborhood; somewhat of a green island, a world by itself, at the same time incorporated into the urban context. The green oasis (plant nursery) is therefore the backbone for the entire project. 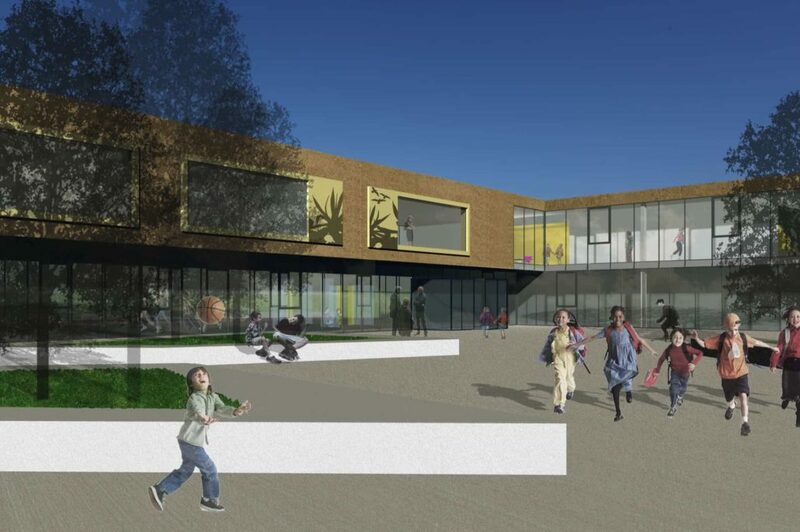 By doing so, the school and kindergarten with outdoor amenities resemble a green island between high buildings, housing estates and shopping malls. The school and kindergarten, a two-storey building with its distinctive organic shape, reacts to a different scale of surrounding buildings and creates a strong urban entity for itself thus becoming a social generator. 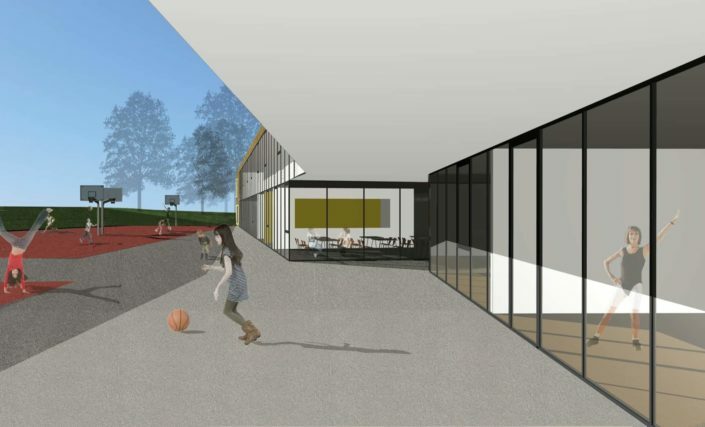 The school and kindergarten for 390 students and 125 children become a small town with interior spaces intended for students and children only, with outdoor spaces open to public use connecting the north, south and west. 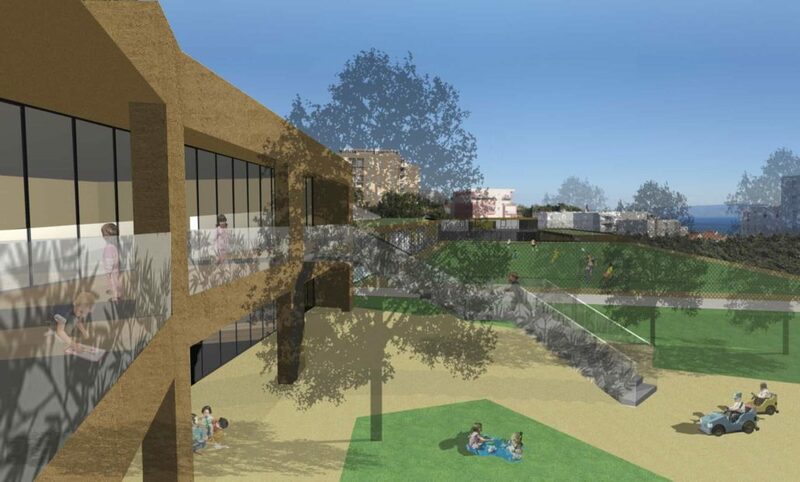 The central position on the plot generates maximum open outdoor spaces, access and views but also creates an appropriate introversion, security and peace essential to student life. The green roof has a strong influence on the entire highly urbanized area. The building itself, just like any classroom/room (except technical and artistic areas), is oriented towards the south and therefore overlooks the sea. The façade finishing is a rough earthy brown mortar, with large frames around the windows of classrooms made of aluminum. Most of these frames have perforated patterns inspired by the landscape, giving each window a unique look. The perforation also creates interesting shadows inside the classroom and allows ventilation. The window is placed outbound, allowing seating in the classroom. The main hall façade consist of glass and is transparent with the extensive green roof creating a fifth façade, visible from the surrounding buildings. This roof provides good insulation in winter and summer. Cabinets are separated from the classrooms with wooden lockers and can be closed by sliding doors. Above the lockers, the wall is made of glass, resulting in well-lighted cabinets. The clay colored plaster, the transparency of the glass, and the green roof contribute to the building blending in with the environment.